In Tuesday’s session of my Digital Archives class, we’re meeting with two of The New School’s archivists, the fabulous Wendy Scheir and Liza Harrell-Edge, to talk about the past, present, and future of the university’s archives, including especially their ongoing collaboration with Collective Access in creating a new collection management system. Then, for the second half of the class, we’re meeting with Kit Laybourne and Peter Haratonik, two of the founding faculty of our Media Studies program — and of its precursor, the Center for Understanding Media. 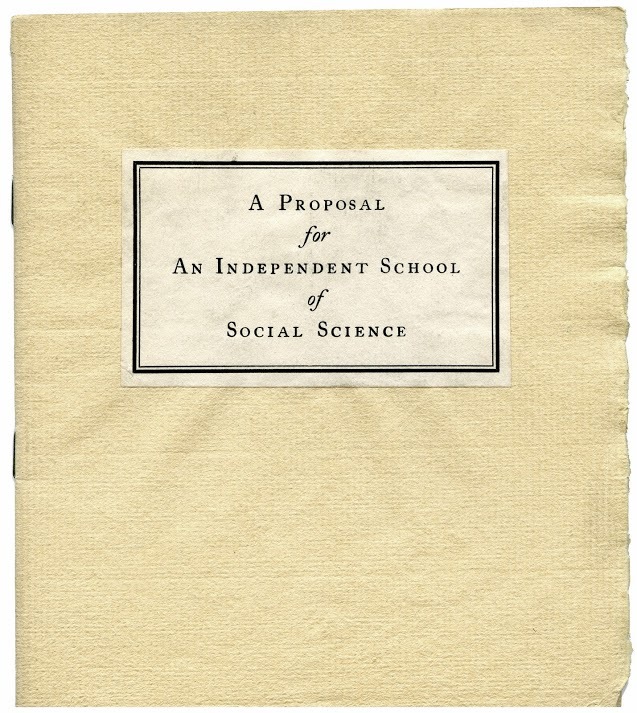 In preparation for class, the students will have read a few published articles on New School history (most of which make use of archival material); and several representative archival documents from key moments in TNS history — the university’s founding in 1919; the addition of the University in Exile in 1933; the mid-70s, when the Center for Understanding Media was integrated into The New School, etc. 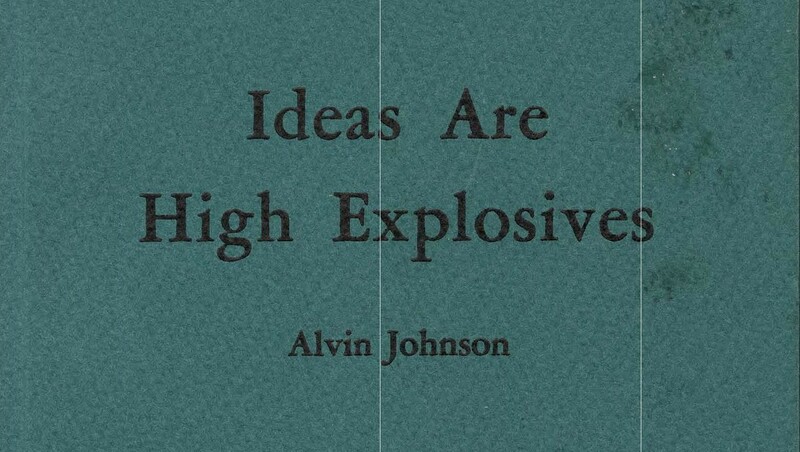 As always happens — like that time I perused some old course catalogues and found a crapload of amazing courses from the 20s, 30s, 40s, and 50s, taught by insanely awesome people — I’m tremendously impressed by the ethos and innovation of this university. Consider this: the 1919 course catalog notes that “courses of study have not been arranged under usual departmental headings — political economy, sociology, history, psychology, etc. — for this tends to obscure the constant connection and interplay of the various interests and activities of mankind.” All that recent talk about problem- or scenario-based curricula: they were on it in 1919. 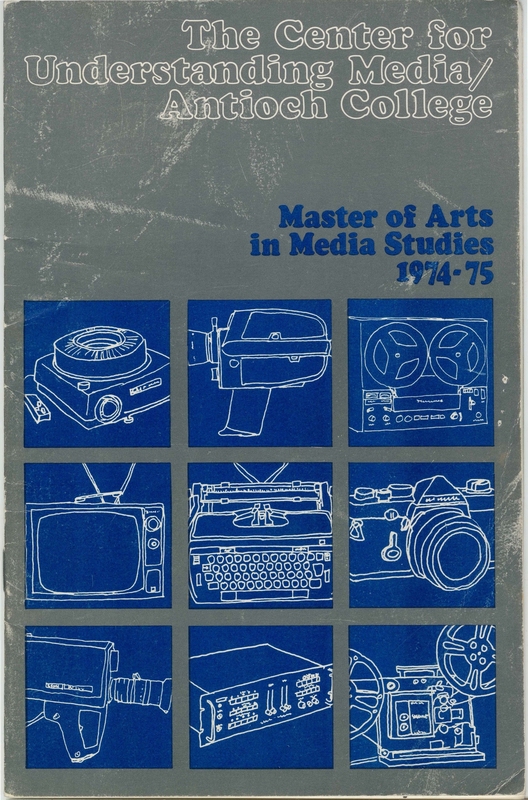 I’ve also come to appreciate, anew, just how progressive our Media Studies program was, in merging courses on the historical, philosophical/theoretical, and critical study of media; the study of media from other disciplinary perspectives; and the making of media. Kickin’ it praxis-style since 1969. 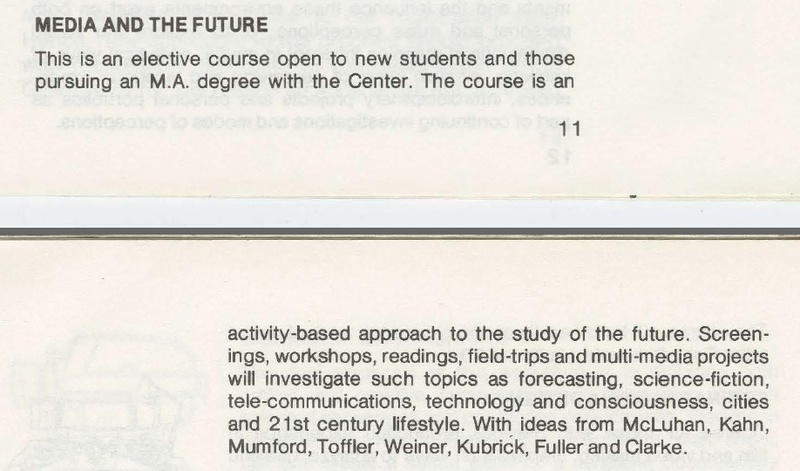 The Center’s 1974 guide lists several courses that were obvious precursors to those we teach today — including our “intro to grad studies” lecture course. 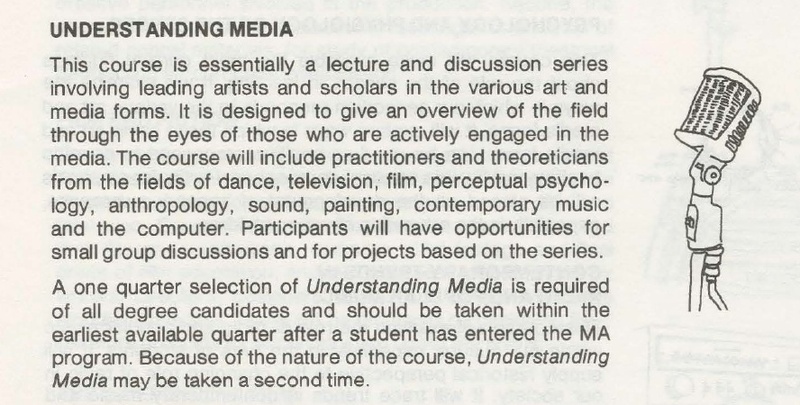 Their version was called “Understanding Media” — after McLuhan, of course; the contemporary version is “Understanding Media Studies.” I teach it occasionally. The Old Schoolers also offered a fascinating course on “Media and the Future,” which would certainly appeal to all the “speculative realists” and “design fiction”-ists and techie futurists of today. We’ve offered courses in sound for a looong time — think Henry Cowell, Hans Eisler, Aaron Copeland, John Cage. 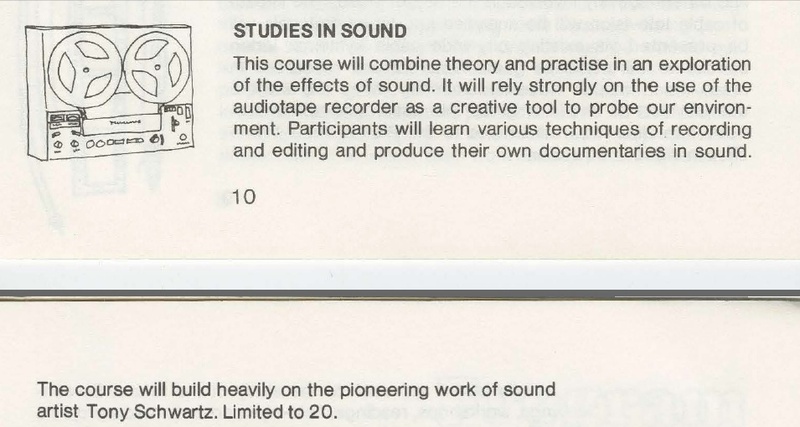 In your face — err, ear, Sound Studies, people! We got here first! 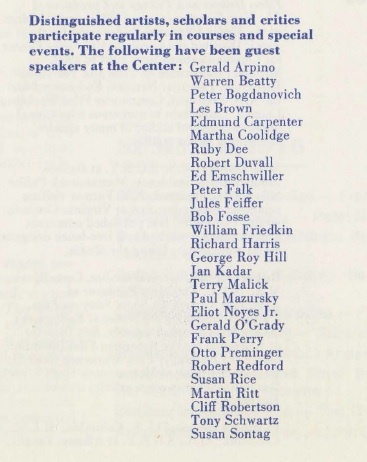 And in 1974 the Center was offering a class that built on the work of Tony Schwartz. 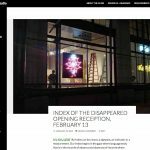 Inspired no doubt by McLuhan’s sensorium, the faculty were also looking beyond sound to address media’s appeals to the other senses. Sensory studies has certainly enjoyed a resurgence in recent years, too. The senses were made tactile on the embossed cover of the 1975 catalog, which also included a list of regularly featured guests: from Edmund Carpenter and Bob Fosse to Eliot Noyes <sigh> and Susan Sontag.